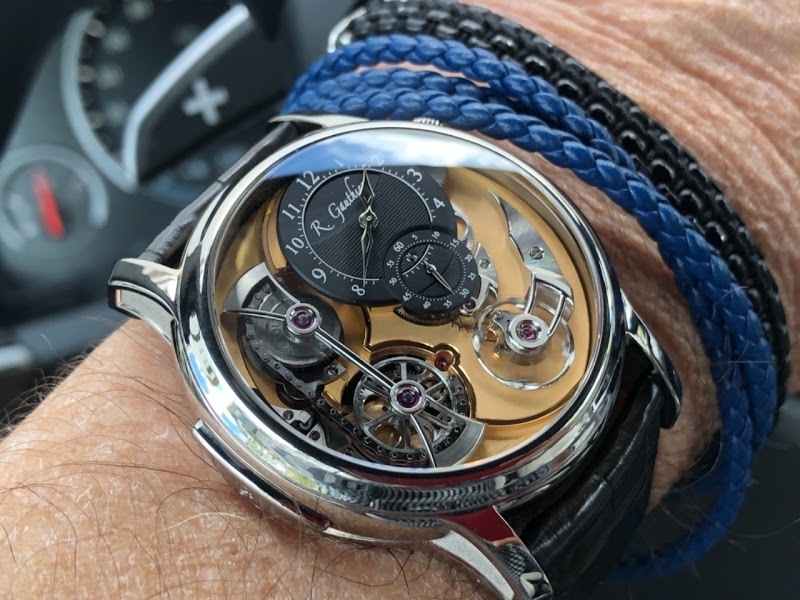 Hi all, I rushed to the DHL office to pick up my Romaine Gauthier logical One today, I simply could not wait for the Monday delivery! I was not disappointed, maybe the first watch I’ve ever opened that caused a physical sensory reaction. Nothing like it, I’ve been hunting this watch for months and found it at the Collected Man in London, thanks Robert and Zsuzsa, I couldn’t be happier. Great service, fair deal and the watch is perfect. Can you give us more info? Maybe a review? that is a beauty to say the least and it looks amazing on your wrist. Enjoy it to the fullest my friend !! This is one I dream of adding one day. It’s just another level of awesome. Very happy for you. Enjoy it in the best of health! Having had the opportunity to examine a few of these I can appreciate your excitement. Just an amazing watch, loupe or no loupe. I'm somewhat jealous that you have the wrist to pull this off, for me this watch is just a mm or two too large. And stoked for me you will be bringing it over to dinner tonight! Congrats to you and congrats to RG for creating IMO one of the most incredible timepieces of this decade. :-) Hi Raymond, great shots! clean out my lower usage watches and start moving up. Thanks Jim....happy this works out great for you. Jim that is a major catch. Big congrats wear it in best of health! It is an amazing watch! you made a great decision on this one. Keep enjoying it in good health. I would like to echo your watchmaker. Oh my! Romain’s watches are build to perfection on so many levels. Amazing pieces. Congratulations and enjoy! more of an expert than me aperently..;-) You are correct and here is a link to a site with nice explanation i found. What a great, wonderful, fascinating piece of art! Yes, a piece of art! What a journey this one has been on! This was my personal watch, which I sold to England, and now it has made its way all the way back to Southern California! Glad to see it found a good home. Enjoy it!